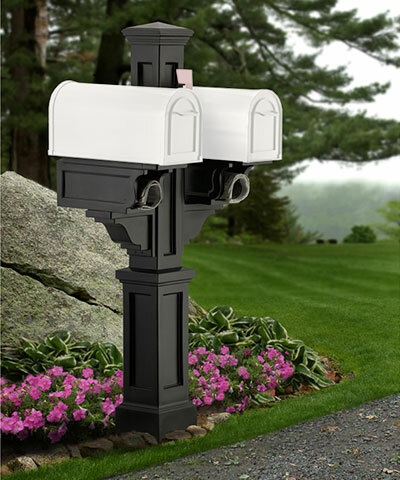 Double the beauty in your lawn with the Mayne Rockport Double Mailbox Post. This 57" tall post includes two brackets and arms, perfect for multi-family housing. Place an included newspaper arm on each side for an even, balanced look. The insets of the post and each newspaper arm all feature beveled edges for added visual interest. Customize each side, and keep your mail separate, by mounting a mailbox up to 8 pounds (not included) atop the newspaper arm. Slide a 4 x 4 wooden post (not included) up through the mailbox post for added strength and stability. Made from sturdy vinyl and polyethylene, this post will not fade, peel, crack, rot, or warp, and the black color lends even more elegance to it. Clean the post by rinsing it with a garden hose. Add the Rockport Double Mailbox Post to your yard for a beautiful yet sturdy receptacle, year after year. Some assembly required. Made in the USA. Fifteen year limited warranty. Note: This description refers only to the Mayne Rockport Double Mailbox Post. Mailboxes, mounting equipment, and the wooden post are not included.